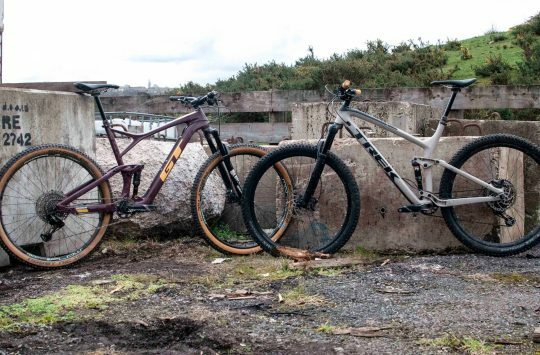 Fox Racing has been in the mountain bike protection game since the very early days. Remember those days? You know, the ones where everyone wore bug-eye Oakley glasses, had blonde tips in their hair and watched the kind of mountain bike videos that only featured thrash metal from start to finish? Back in those simpler times, body armour was all hardshell tough stuff, and Fox was one of the brands that offered a full complement of pads for the pioneering freeriders and downhill racers who spent their spare time throwing themselves down stupid steep terrain on equally stupid steep dual-crown bikes. 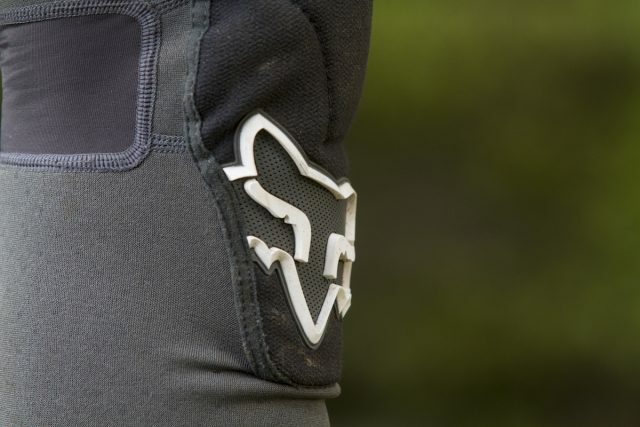 The Launch Enduro knee pads are the most lightweight option from Fox. Things have changed a little since then, and so has the protective wear market. While Fox still offers a range of hardshell body armour, more and more these days, riders are electing to use softshell armour that offers improved ventilation and flexibility for all-day pedalling. The Launch Enduros are such a garment, and are designed to appeal towards XC and trail riders who appreciate a comfortable knee pad. 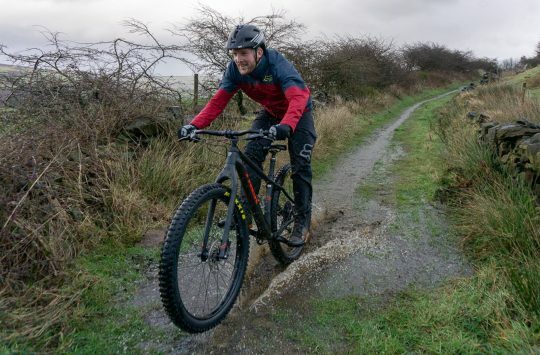 In a range that totals seven different options, the Launch Enduros are Fox’ lightest knee pad option, and so slotted perfectly into our Pads For Pedalling group test. They come in four sizes and are also available in an elbow version too. 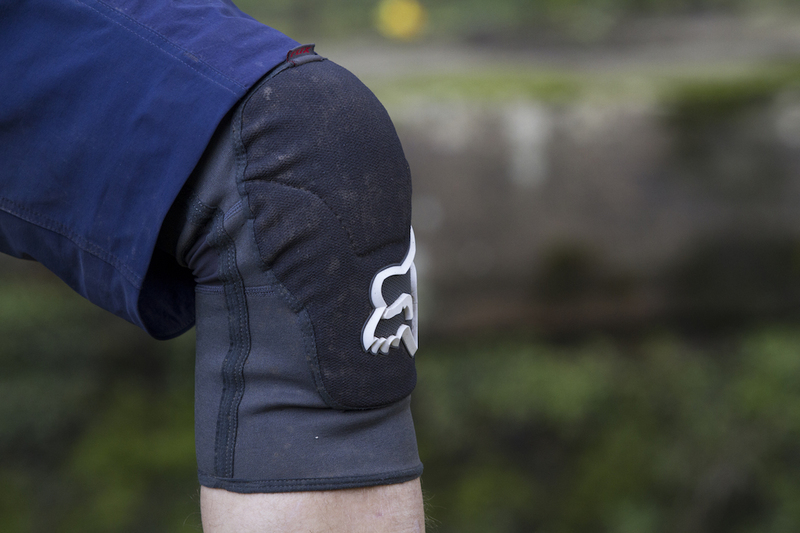 Designed for all-day pedalling, the Launch Enduro knee pads offer flexibility and breathability. 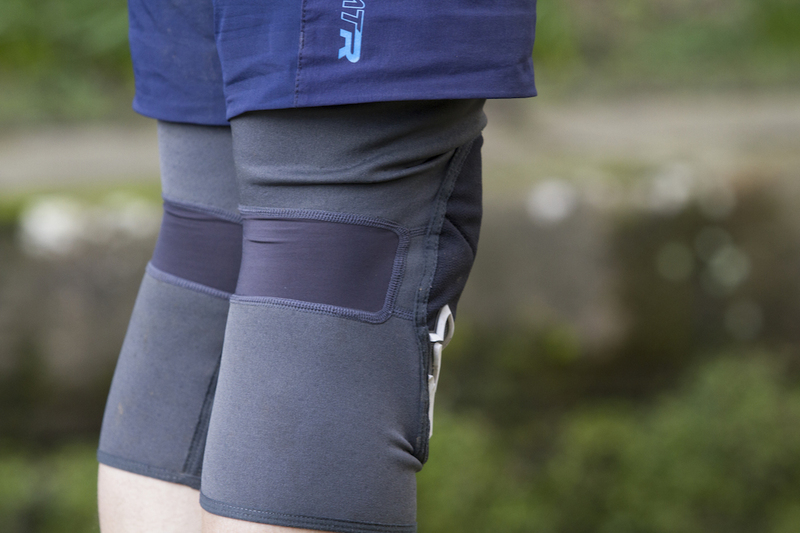 The Launch Enduros feature a tube-style construction that mimics a heavy duty knee warmer. 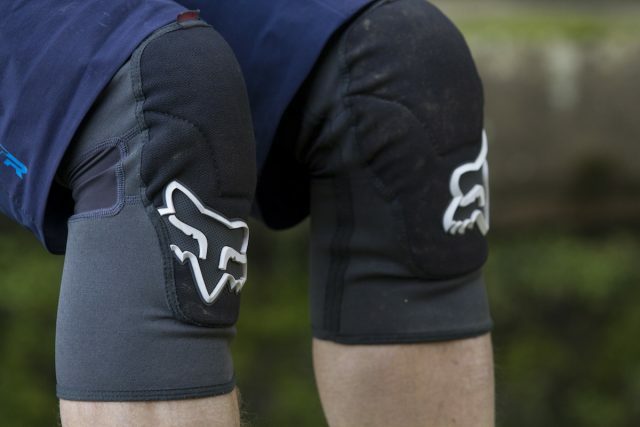 The Fox Launch Enduro knee pads elect for the minimalist approach, with a tube-style sleeve that slips straight on over your knees like a thick knee warmer. 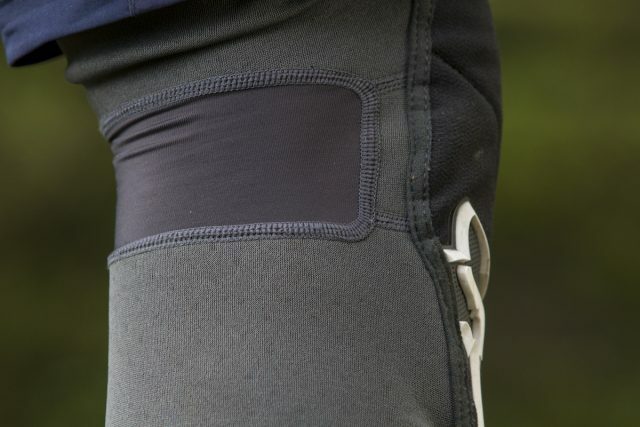 The body of the knee pad is made from neoprene, so it offers plenty of stretch to keep it snug from top to bottom, and an additional elastic band is used around the top cuff. Inside that band is a thick panel of silicone detailing that runs around the entire circumference of the tube to help prevent the pad from slipping down your upper thigh during use. Small mesh windows at the back of each knee enhance ventilation. The neoprene fabric is dotted with perforations to increase ventilation, though rectangular mesh ‘windows’ directly behind each knee cap help to keep you from getting too sweaty. The pads are slightly asymmetric, so there’s a left and right specific pad, with the rubberised Fox logo facing outwards from the bike. The rubberised Fox logos offer a touch more abrasion resistance on the outside of each shin. While Fox does offer knee pads with fancy high-tech materials like D3O, the Launch Enduros are quite understated when it comes to its defensive line. The protective panel consists of a single piece of soft density foam that’s perforated for breathability, and is articulated to wrap around your knee cap. A layer of tough fabric covers the protective pad, and offers good tear resistance. The protective pad does extend down a couple of inches down the top of the shin, and it also curves somewhat around the face of the kneecap, but there isn’t a whole lot of protection on offer here. If you’re expecting more contact with hard and fast-moving objects, consider the Launch Pro knee pad, or the Launch Pro D3O knee pad if you’re chasing hardshell protection. A soft foam pad covers each knee cap to deliver some cushioning against small impacts. When first slipping on a pair of Fox Launch Enduro knee pads, you’re greeted with a lovely snug feel that really does emulate the heavy duty knee warmer vibe. The fit is close to skin, and the neoprene tube delivers great flexibility that makes them unnoticeable within the first 10 minutes of riding. 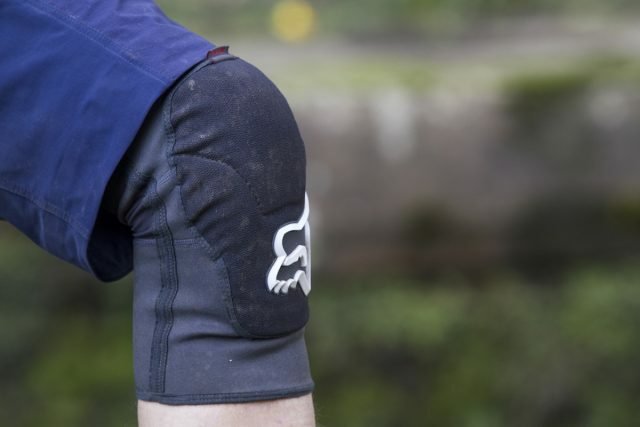 In fact, the Launch Enduro knee pads narrowly missed out on the ‘Most Comfortable’ award in our Pads For Pedalling group test, only just being edged out by the Troy Lee Designs Speed Sleeve. The only minor issue we encountered with the Launch Enduro pads was that the top cuff would start to slip down the thigh on longer rides, leaving fabric bunching up at the top of the knee. 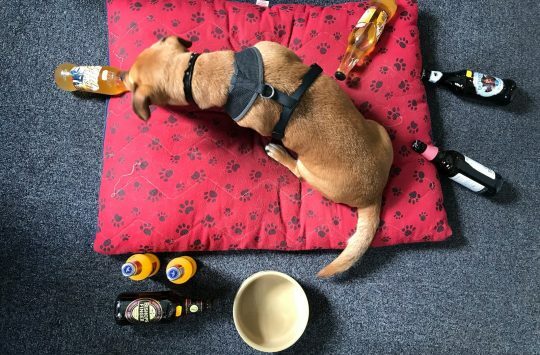 Though in reality it caused no particular bother. Otherwise we’d happily recommend the Launch Enduro knee pads, and particularly for those new to the knee pad world and are simply after the best alternative to wearing no knee pads at all. To that end, the Launch Enduro pads are quickly forgotten on long pedally rides, while still offering some abrasion and light impact resistance for the odd bump and scrape that an XC or trail rider might encounter. That said, if you’re actually engaging in full-blown enduro racing (I know, the name of these pads is misleading), then you’ll want to step up the protection levels to something like the much burlier Endura SingleTrack knee pads. The Launch Enduros are supremely comfortable knee pads that’ll leave you with no excuse to leave the house without wearing them. As the lightest set of knee pads in the Fox range, the Launch Enduro pads are ideal for two types of riders; those who clock up loads of miles during all-day XC rides, and those trail riders who prefer not to wear knee pads at all. With excellent comfort and impressive flexibility, it doesn’t take too many pedal strokes before you forget you’re wearing Launch Enduro pads. There isn’t a whole lot of padding on offer, so seasoned knee pad wearers and those who have a habit of hitting the dirt on a reasonably frequent basis will want to consider something tougher like the Fox Launch Pro knee pads. But as a lightweight pad for pedalling, the Launch Enduros fit like a glove and leave you no excuse to leave the house without wearing a pair of knee pads.